The New Edition Story, a six-hour biopic, starts its three-night run Tuesday on BET. The biographical miniseries chronicles the roller-coaster ride of the group on and off the stage from their humble beginnings in Boston to superstardom to individual solo success to the breakup and reunion with Bobby Brown and more. Powers has only seen video excerpts of the movie and is excited to finally see the final edition of the film. 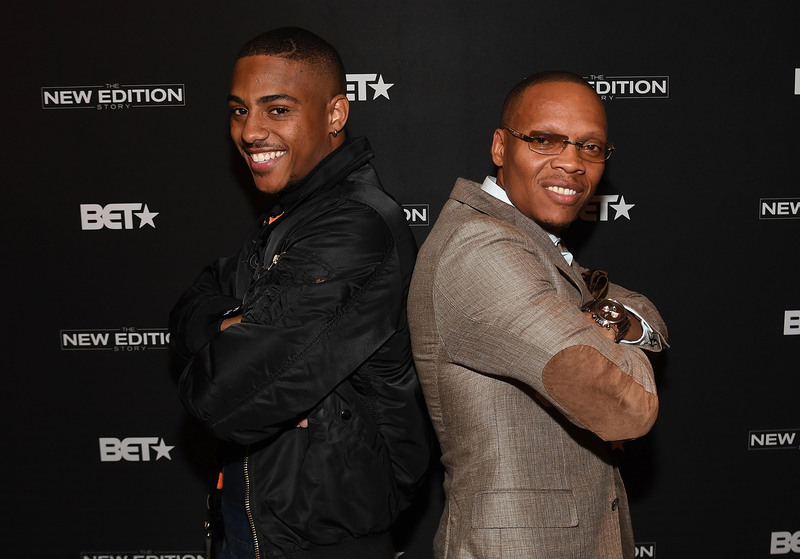 Actor Keith Powers and singer Ronnie Devoe of New Edition attend BET’s Atlanta screening of “The New Edition Story” at AMC Parkway Pointe on January 5, 2017 in Atlanta, Georgia. “It’s basically covering them from ‘Candy Girl’ when they were 12, 11 and 10 years old all the way up until the BET [Silver] Anniversary [Special] in 2005,” Powers, 24, said. “I’m so excited about it. I think it’s really going to be big for African-American movies and television. But also good for New Edition because they deserve something like this and the culture of boy bands. We’re missing boy bands, especially African-American boy bands. So this is going to be huge. Powers is most well-known for acting in the role of Dr. Dre’s little brother, Tyree, in Straight Outta Compton. The Sacramento, California, native has also had roles in MTV’s Faking It and Yahoo’s Sin City Saints. He is hoping that The New Edition Story will be his big Hollywood break. “I want to do movies that inspire people,” he said. “I want them to come up to me and say, ‘That part you played on …’ I’m so happy because I can be that person that helps them escape reality. People have bills and stuff, but they can go into a movie for like two hours and can watch their favorite movie or actor and escape their problems. Powers talked to The Undefeated about his high school football career, learning the group’s dance moves, mastering DeVoe’s swagger and accent, and making a difference in his hometown. How familiar were you with New Edition’s music before you landed the role of Ronnie DeVoe? I knew what my parents played for me. I grew up loving ‘Can You Stand The Rain’ because of my dad. But just like with Straight Outta Compton, I learned about Easy E and all of them, the Dr. Dre music. So I already knew ‘Candy Girl’ and ‘Cool It Now,’ ‘Can You Stand The Rain,’ ‘If It Isn’t Love,’ ‘Poison,’ of course. Did you meet Ronnie DeVoe? Yes. I met the whole [group]. They were at our boot camp. They met with us. We had to do boot camp for a month. We had to dance with the group. We had to play keep-up. We learned from their original choreographer, Brooke Payne. It was nerve-wracking. Ronnie is supercool. Ronnie helped me with the moves and taught me the moves in a way that I could learn. I know how to dance, but I don’t know choreography. If you played sports, you can learn choreography, because it’s all about counts and footwork. How good of a football player were you? Playing football at Sheldon High School in Sacramento probably helped you with your dancing for the movie. I was good, but I wasn’t great. It was not that I couldn’t be great. It was because I didn’t put the effort in, like, going to work out or run. I played wide receiver my junior year and safety my senior year. I was coordinated. It helped me pick up the dance moves and the counts. It was natural. It was crazy. When I had to do some of the moves, my feet already knew what to do. Like once they taught me like twice, I was like, ‘How do my feet know where to go?’ That’s from football, doing ladders, up-downs and backpedaling. Were you nervous about the dancing in the film? I was so nervous. That was the first time I thought, ‘Man, I might quit.’ I got cast a week after the boot camp started, so I had to learn moves twice as fast. I had to go to boot camp from 9 a.m. to 10 p.m. just to play catch up. The rest of my cast members would be there from 2 p.m. to 10 p.m. So I had to dance with the little kids as well who play the younger version of New Edition. I was trying to learn the medley, which was all their hits put in a 10-minute routine. I remember at the beginning of it taking my hat, throwing it and going outside. I thought, ‘Man, this might be the first thing that I legitimately quit.’ I didn’t want to be a part of something and not do my part like I was supposed to. One of the [directors] came outside, told me to take a deep breath and said, ‘You’ve only been here three days. You’ve learned everything faster than the rest of the cast because you had to. You got to relax and you got to trust it.’ So I said, ‘Let’s go,’ and I started to learn it. When you were around DeVoe, did you pay close attention to his speech and mannerisms? I had to get down how smooth he was. He has a natural smoothness. It’s hard to explain. And when he danced he had a bounce that everyone recognizes. I had to get down his bounce and his Boston accent. But it’s a mix, it’s like a ‘hood Boston accent, not traditional, mixed with a Southern influence as well. That wasn’t as hard as picking up the dancing. I thought the accent would be harder, but it actually wasn’t. I would also call him in the morning before we were shooting and ask, ‘Ronnie, what slang words did you use back in the days that I could throw into this dialogue?’ He’d just tell me a few things. What kind of relationship did you build with DeVoe? Singer Ronnie DeVoe (L) and actor Keith Powers attend the “Shots Fired” and “The New Edition Story” screenings at the AMC Empire 25 theater on September 24, 2016 in New York City. Did you have to learn to lip-synch the songs? No. We rerecorded all the songs. I can sing. But Ronnie DeVoe wasn’t their biggest singer. I can sing enough to do ‘Poison.’ We had to rerecord ‘Poison.’ We had to rerecord the background stuff, too. So you did the BBD raps, too? What was Bobby Brown like? He’s supercool and super laid-back now. I was definitely nervous. My dad is a huge Bobby Brown fan. He’s an icon. You hear all the crazy stories about Bobby. But when you meet him now, he’s calmer because he’s older. He has his own cooking company. He’ll say some funny stuff out of nowhere, though, that will surprise you. Are people recognizing you more after your role in Straight Outta Compton? What was the challenge in Straight Outta Compton? It wasn’t as challenging as New Edition because I was introducing people to Tyree. People didn’t know about Tyree or that Dr. Dre had a little brother. I was able to bring him to life in my own way. With Straight Outta Compton, I had more of a responsibility to Dr. Dre than the fans. If I made Dr. Dre happy, no matter how the movie does, I was going to be happy. What is it like being a black actor today and do you feel you’re blooming at a good time? It’s perfect and great timing. After the #OscarsSoWhite and people were complaining about that, we were mad and frustrated. It wasn’t about putting more black people into your movies. It was about getting more opportunities. You got some Caucasian actors who are going to get a movie that is Oscar-worthy every year. Even if they don’t win, they know they are going to get another Oscar movie. Before, there were not a lot of black filmmakers and directors, but now you are getting more of that. You have blacks at a smaller scale getting their movies into film festivals. People are buying black movies from film festivals like, Dope and Birth Of A Nation. You recently visited the Boys & Girls Club in Sacramento. How important is Sacramento to you? People here don’t think about being in the industry or acting. Sports is different. We have a lot of athletes from Sacramento. But when they think of the entertainment industry, they think it’s so far off. I want to be that person that really changes that when they see me. What will viewers get from The New Edition movie? They will get to see how great New Edition was. For the kids who don’t know about the music, they will get educated on it. They will get a great story on brotherhood. The main thing people will get from this movie is all the drama they dealt with offstage with each other and would still go on stage and perform together. They will come in and argue and fight, and the lady from Soul Train will say, ‘Hey, y’all going to be on in five minutes.’ They would fix up, get on smile, smile, dance, kill it and get back on stage to their problems. They will see professionalism. And that’s something this generation lacks: great professionalism. Bands back then were dealing with a lot of stuff, especially with money they were owed. But they would still get on stage and kill it with raw talent. None of the B.S. You’ll get a great deal of respect from this film. Famous In Love, which is a TV drama series. It’s Entourage meets Gossip Girl and it comes out April 18. And I got a comedy called Reality High that’s the new-age comedy, raunchy that would like American Pie, Road Trip, that is coming out on Netflix in the summer.